Host Neil deGrasse Tyson travels faster than the speed of light in the Ship of the Imagination to journey beyond the event horizon of a black hole in the all-new "A Sky Full of Ghosts" episode of COSMOS: A SPACETIME ODYSSEY airing Sunday, March 30 (9:00-10:00 PM ET/PT) on FOX and Monday, March 31 (9:00-10:00 PM ET/PT) on Nat Geo. The night sky may be a dazzling sight, but it turns out that you can't always trust your own eyes when looking up at the cosmos. Actor Sir Patrick Stewart is the voice of astronomer William Herschel appears in the all-new "A Sky Full of Ghosts" episode of COSMOS: A SPACETIME ODYSSEY airing Sunday, March 30 (9:00-10:00 PM ET/PT) on FOX and Monday, March 31 (9:00-10:00 PM ET/PT) on Nat Geo. "Every star is a sun as big, as bright as our own," Stewart's Herschel said during the program. "Just imagine how far away from us you'd have to move the sun to make it appear as small and faint as a star. The light from the stars travels very fast, faster than anything, but not infinitely fast. It takes time for their light to reach us. For the nearest ones, it takes years, for others, centuries. Some stars are so far away, it takes eons for their light to get to Earth. By the time the light from some stars gets here, they are already dead. For those stars, we see only their ghosts. We see their light, but their bodies perished long, long ago." William Herschel and his sister Caroline both probed the heavens, working as astronomers for years. The new episode also detailed some of the other illusions skywatchers see when they look up into the sky. For example, the sunrise is actually an illusion. Earth's atmosphere distorts sunbeams in such a way that it makes it look as if the sun is rising, when it is still technically below the horizon. "Seeing is not believing," Tyson said at the start of the show. "Our senses can deceive us. Even the stars are not what they appear to be. The cosmos, as revealed by science, is stranger than we ever could have imagined. Light, and time, and space, and gravity conspire to create realities which lie beyond human experience." One of those seemingly unattainable realities is what happens inside of a black hole. 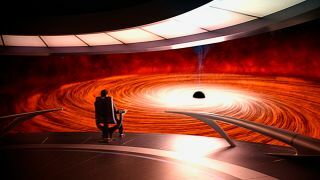 Scientists are still debating what would happen if a human fell into a black hole, and "Cosmos" took its viewers on a wild wide through the bowels of the super-dense cosmic object. "If you could survive the trip into a black hole, you might emerge in another place and time in our universe, circumventing the first commandment of relativity: Thou shalt not travel faster than light," Tyson said. "Nothing can move through space faster than light, but space is not mere emptiness. It has properties. It can stretch, shrink. It can be deformed, and when that happens, time is deformed, too." The fourth episode of "Cosmos " will re-air tonight on the National Geographic Channel at 10 p.m. ET/9 pm CT. "Cosmos" airs on FOX Sundays at 9 p.m. ET/PT. Check local listings. You can watch the first four episodes of "Cosmos: A Spacetime Odyssey" free online via Hulu.